Kind of ironic how your mobile device is called a ‘smartphone’, and once we lose it, we feel completely dumb and useless. In Dubai and Abu Dhabi, as the rest of the world, we rely on our phones for everything – keeping touch with our friends around the globe, preserving a lifetime record of your photos, getting work done while you’re on the move when traveling, and most annoyingly, snapping photos of every morsel of food you eat during the day. That would explain why when we drop our phone, our hearts skip a beat, we begin sweating profusely, and we get that dizzying feeling that life if over as you know it. Best case is that you may have panicked because you dropped your phone, but it’s not damaged at all. Modern phones are built to take a beating to a certain extent. Minor damage could occur, most commonly a scratched screen. If it’s not serious and you aren’t too OCD about it, you probably can live with a scratched screen. If not, you can get it replaced, but bear in mind that you may have to pay a premium to use your original phone parts (especially Apple iPhones and premium Samsung devices). Major damage is not as common as you may think. 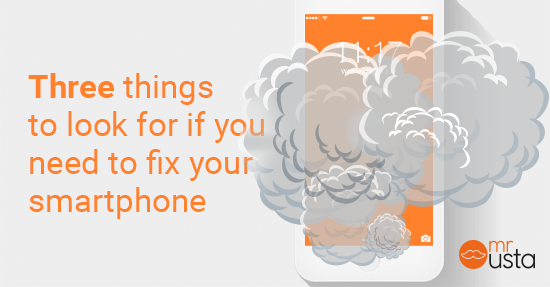 Something major would be your screen being completely shattered and rendering your phone unusable. Another possibility is that the sensitive electronics in your mobile were damaged in some way. In this case, you are left with two choices: write-off your phone and get a new one, or try to get it fixed professionally. You’re also left with a choice here: you can send your phone off to the official brand representative in Dubai or Abu Dhabi (if your damage is under warranty, definitely go with this direction), or you can find a freelancer or independent phone repairman to do it for you. Getting your phone fixed at the official dealer does come with a cost through – they charge a premium for labor costs. Independent professionals will generally cost less are their overheads are significantly lower. Your Apple iPhone or Samsung phone is basically an extension of yourself. So the first thing you should ask is “when do I get it back?” Almost all parts for major phone brands are available on-hand in Dubai and Abu Dhabi, and most fixes can be done within a day or even a few hours. But you’ll need to clarify this with your repairman, as you don’t know their workload on any given day. Official repair shops (those from the brands like Apple and Samsung) will typically take a longer time. Second question naturally should be “how much?” The answer you get well help you figure out whether it’s worth the investment or that it makes more sense to buy a new iPhone or Samsung phone. After agreeing on cost, your follow up question should be “what’s my warranty?” Most professionals will offer a warranty on the repairs. This can range from a month to a year, depending on the model of your phone and the shop policy. If they DO not offer a warrant, that should be a warning sign. Turn around and walk away NOW! Phone repair is a highly competitive market in Dubai and Abu Dhabi, so many shops will offer value-added services for free. So ask them “will you pick up/deliver my phone?” Depending on your schedule and where you live, this is a very convenient service you should definitely take advantage of, and best of all, it’s mostly cost-free. Great news is that Mr Usta covers all kinds of phone repairs so we’ve done all your homework for you. We’ve recently introduced an Instant Booking option for Apple iPhones and iPads. It’s an amazingly convenient service! Just simply choose your model, and whether you want your phone picked up and delivered or fixed on site! Yes! You don’t need to let your iPhone out of your site if you don’t want to! For all other phone brands, you can post a job here and get up to five highly qualified Ustas (service providers) who will get your Samsung, HTC, Huawei, or any other brand of phone fixed (yes – even Nokia) to get your phone back in tip-top shape!